A 66-year-old woman with no past medical history was admitted for 3 months of worsening dyspnea, lower extremity edema, and orthopnea. She was not taking medications or supplements. She denied chest pain, recent infections, fevers, toxin exposures, or use of drugs or alcohol. She reported patchy hair loss on her scalp, bruises on her lower extremities, gingival bleeding, and burning of her lower extremities. All these symptoms appeared to have started within the previous year. She said that her diet during the past 2 years had consisted solely of processed cheese chips and vanilla cake. Her physical examination was notable for body mass index of 17, temporal wasting, and patchy hair loss. 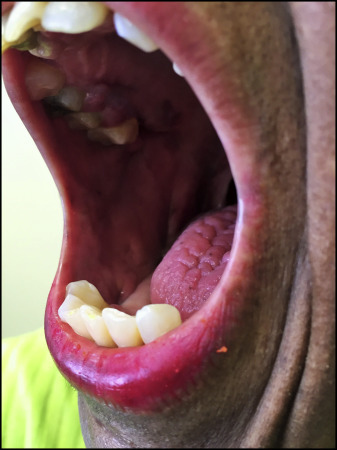 Her oral cavity revealed friable and hypertrophied gingivae along with severe periodontal disease (Figure). She had elevated jugular venous distention, pulmonary crackles bilaterally, and lower extremity edema. The skin was notable for bilateral lower extremity ecchymoses and nail dystrophy. The vital signs were normal. Labs were significant for hemoglobin of 10.3 g/dL with mean corpuscular volume of 103 fL. Her electrocardiogram showed no signs of active or previous ischemia. A transthoracic echocardiogram demonstrated global hypokinesis and left ventricular ejection fraction (LVEF) <20%. Her nuclear stress test was not consistent with ischemia. Evaluation of her serum vitamin levels showed she was deficient in Vitamins B1 (thiamine), B6, C, and D.
The patient refused all medications. We administered thiamine, vitamin D, vitamin B12 injections, and multivitamin tablets. The patient was counseled to consume a balanced diet. After 3 months, the LVEF had improved to 50%. The hemoglobin improved to 13.3. Her heart failure symptoms had resolved completely. Her periodontal disease improved. Her final diagnosis was nonischemic cardiomyopathy with hypovitaminosis. The Great Masquerader Strikes Again!